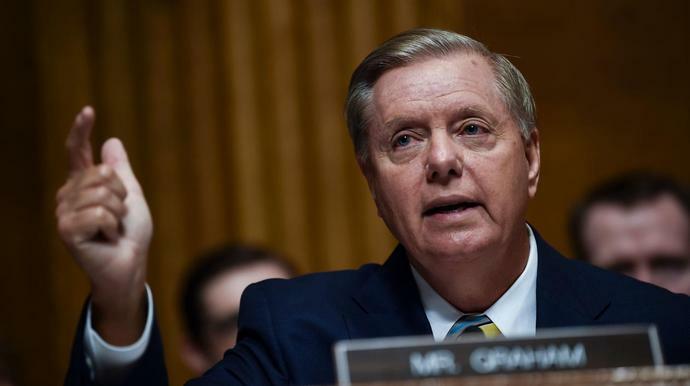 Sen. Lindsey Graham (R-S.C.) released a statement on Tuesday calling on President Donald Trump to renominate alleged sexual abuser Brett Kavanaugh to the Supreme Court should his current nomination fail. Graham opened by sharing his admiration and empathy for Kavanaugh and his family, imploring other senators to "not quit on him," before diving into the senator's suggestion to the president. "I believe Judge Kavanaugh will be confirmed to the Supreme Court very soon," Graham said. "However, if his nomination were to fall short, I would encourage President Trump to re-nominate Judge Kavanaugh to the Supreme Court. It would ― in effect ― be appealing the Senate's verdict directly to the American people." Graham also noted that the midterm elections are "only 35 days away" and "a new group of senators" might view Kavanaugh's nomination "very differently after hearing from the voters in their states." The written statement from Graham followed his rhetoric Monday night on Fox News' "Hannity." "Here's what I would tell the president: I would appeal the verdict of the Senate to the ballot box," the senator said on "Hannity." "This good man should not be destroyed. If you legitimize this process by one vote short, we'll be on to the next person. I'd hate to be the next person nominated. I would feel horrible that we destroyed Kavanaugh. So what would I do? I would renominate him and I would take this case to the American people and I'd ask voters in Indiana, in Missouri, in North Dakota and other places where Trump won ― saying who he would nominate if he got to be president ― and see if the voters want to appeal the verdict of their senator." Graham specifically named three states where incumbent Democratic senators are up for re-election in November. On Tuesday, Trump evaded a direct response to Graham's suggestion, although he complimented the senator. "This was Lindsey's idea. Lindsey's a friend of mine, at least for the last six months as you know. Lindsey's a friend of mine," the president said. "He's done really a great thing and a great service for our country. ... I have to say that I really think that Judge Kavanaugh is going to be accepted and voted on and positively voted on. We're going to have to see what the FBI says," said Trump. Graham also said on "Hannity" that he doesn't believe the FBI investigation into the Kavanaugh allegations will yield anything to change the vote of Sen. Jeff Flake (R-Ariz.). "I don't think we're going to find anything new from this supplemental FBI investigation to take Jeff from yes to no," said Graham. Last week, a day after the testimony from accuser Dr. Christine Blasey Ford and Kavanaugh himself, Flake, backed by Sens. Susan Collins (R-Maine), Lisa Murkowski (R-Alaska) and Joe Manchin (D-W.Va.), asked for the supplemental FBI probe prior to a full Senate vote on Kavanaugh's nomination.